The below study is “borrowed” from a report written by Michael Johnson on January 20, 2016. Even though the optimized part originally belongs to a motorbike, the story behind it fits perfectly well in the concept design study of the Three Wheeler Concept Bike as we need a fender there too. The stiffness, strength, weight, cost, and durability of a structure are the driving factors for design. Optimization can be utilized in its purest form for these cases. However, in some applications the appearance of a structure may be just as important as its mechanical performance. Consider the contrasting cases of a crankshaft and a piece of motorcycle bodywork. In the first case, the crankshaft must be durable, stiff, manufacturing-friendly, and maintain a specific inertia and center of gravity. The aesthetics of a crankshaft are of absolutely no concern to the end customer. On the other hand, a prominent piece of motorcycle bodywork is the result of a balancing act between engineering and industrial design to produce a part that is durable and enhances the overall appearance of the vehicle. The ideal result is a piece of art that also happens to be stiff, durable, lightweight, and cost efficient. With an engineering mindset, form follows function. This was the ethos of the analysts early in the development of the plastic front upper fender for a production motorcycle, the timing of which coincided with then-recent optimization training. The goal was to use this fender as a learning device while simultaneously providing usable results. 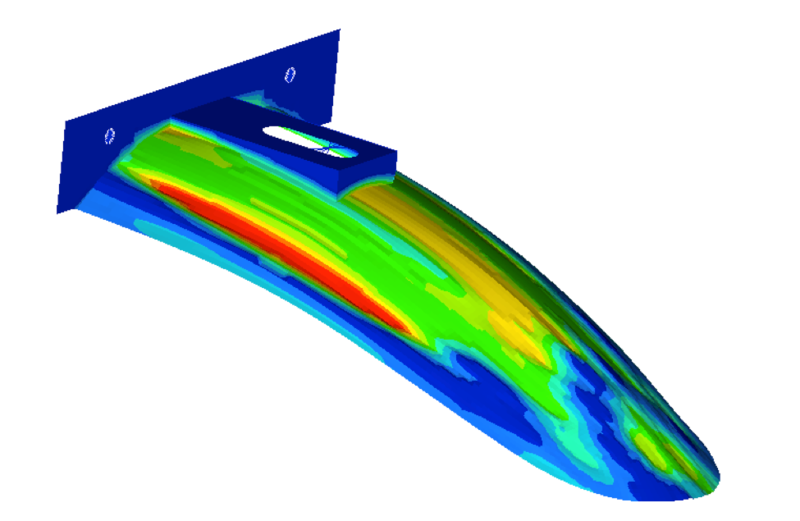 Topology optimization (in this case, finding the most useful material within a solid design space) was used to find a rib structure on the bottom side of the fender to increase first mode frequency on this long flexible part. However, the design team pointed out that an extensive rib pattern would have a few major downsides; producing sink on the cosmetic side of the part during manufacturing and allowing mud packing during use. The next approach combined topography (finding the optimal shape of the 2-D representation of the part, within set limits) and free size optimization (finding optimal elemental thickness, again within set limits), thus avoiding the pitfalls of sink and mud packing. This produced results that excited the analysts, who had achieved significant gains in mode frequency while staying in the bounds laid out by the design team. The first mode of this (reconstructed model) structure had been increased from 64 Hz to 159 Hz. However, when these results were proudly presented back to the design team, they were roundly rejected by the industrial design manager. The topography result was nicknamed the “alligator snout” and the analysts were accused of bashing their design over a rock. Although the vehicle was intended to be a rugged crossover, analogous to an SUV, the design language of the rest of the vehicle was still sporty and smooth. Once discussion with the industrial design team improved this understanding, the challenge was to translate that language into optimization terms. To convey sleekness and speed, the industrial designer indicated that smooth, longitudinal features were preferable to the more complex, possibly X shaped results of the initial topography optimization. Based on this, the designer sat with the analyst and decided on a radial 2D symmetric constraint with a focal point well forward of the tip of the fender. 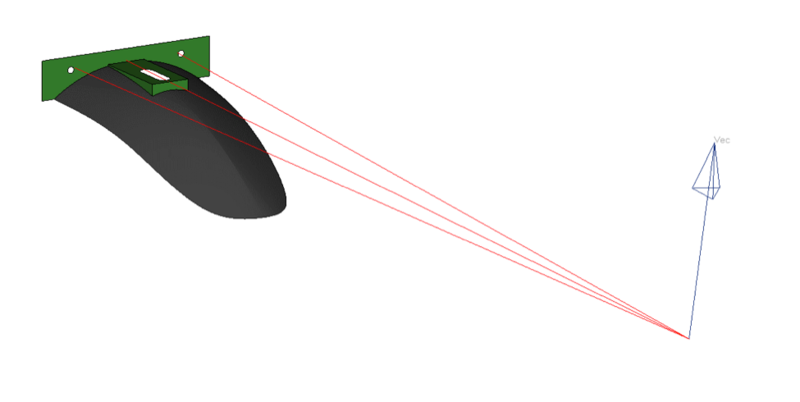 This would force OptiStruct to generate shape variables that run radially away from a central axis (as pictured in figure 2). Any additional constraint on an optimization will compromise the result, but that compromise followed the spirit of the collaboration between analyst and industrial designer. With the new setup, the result of the optimization fulfilled the aesthetic needs and performed nearly as well as the initial topography optimization, with first mode frequency increased to 140 Hz. Beyond learning some of the fundamentals of optimization, this exercise produced a better understanding between analyst and industrial designer. Further, it showed that the mechanical aspects of the part needn’t overshadow the artistic side and vice versa. With a deeper level of involvement, the industrial design team learned that optimization commonly produces beautiful, organic results. What had initially been a conflict between engineers and industrial designers grew into mutually advantageous collaboration.